The biggest challenge B2B marketers face today is that their buyers are invisible until they’re ready to purchase. This makes it difficult to create targeted content and interactions that nurture prospects towards purchase. Educated by their consumer buying experiences, B2B buyers and influencers across the organization gather the pre-purchase information they deem important through their content channels of choice including social media, customer ratings and reviews, search and third party sites. Given this diverse self-serve model, Forrester found that B2B buyers find 3 pieces of content about your firm for each piece of content your organization has created. This other content can come from a wide variety of sources including social media, third party media, customers, former employees and others. As a result, B2B customers are 65-90% of the way through the purchase decision process before they contact your firm! 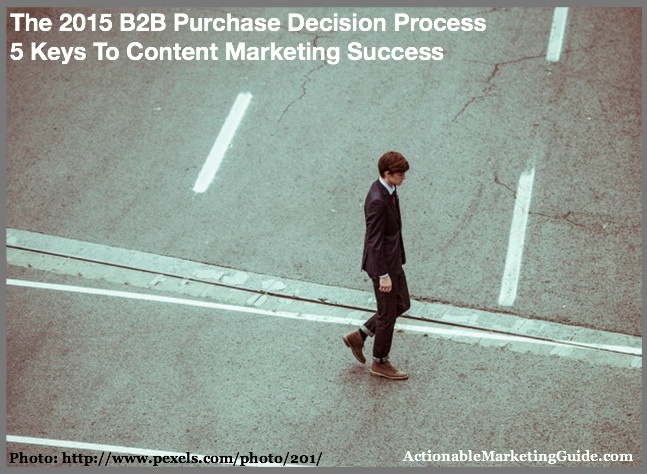 The B2B purchase decision process is a journey that can vary based on business, key decision makers and influencers, both internal and external. Only 5% of website visitors provide an email address for further communications. Only 20% of marketing emails are opened. Only 1% of leads are nurtured. What content business buyers seek and consume? Where do business buyers find the content they need? What do business buyers do next in the purchase process? 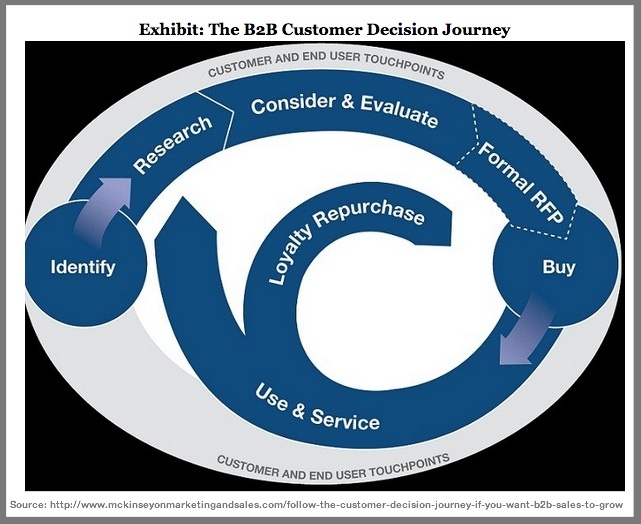 To better understand the 2015 B2B purchase decision process, McKinsey developed the B2B Customer Decision Journey (CDJ). This model emphasizes the importance of post-purchase experience on retaining customers and generating incremental sales. 30% average increase in customer retention. 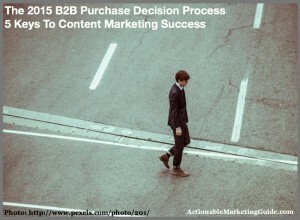 Here are 5 key steps to help your prospects through B2B purchase decision process using content marketing. Reach out across your organization and create a set of marketing persona. At a minimum, include everyone who touches your prospect and customer in the process. Take the time to talk with prospects and customers, where possible and appropriate. Don’t assume that you know who they are and what their needs are. Think beyond reaching specific buyers. Consider everyone involved in the purchase decision and their influencers. Remember information can be forwarded via social media so cast a wide net with your content. 2. Create content your audience wants. Don’t just become a content factory turning out sanitized information that no one wants to read. Instead transform information into easy-to-digest content. 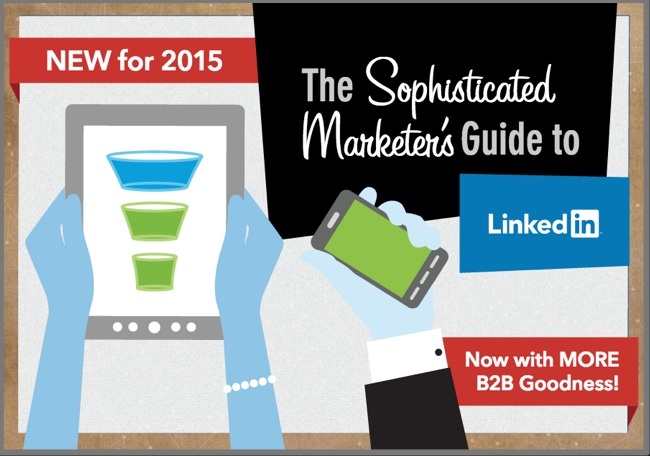 The Sophisticated Marketer’s Guide To LinkedIn is a great example. It contains data and influencer interviews to help readers while subtly promoting their product suite. 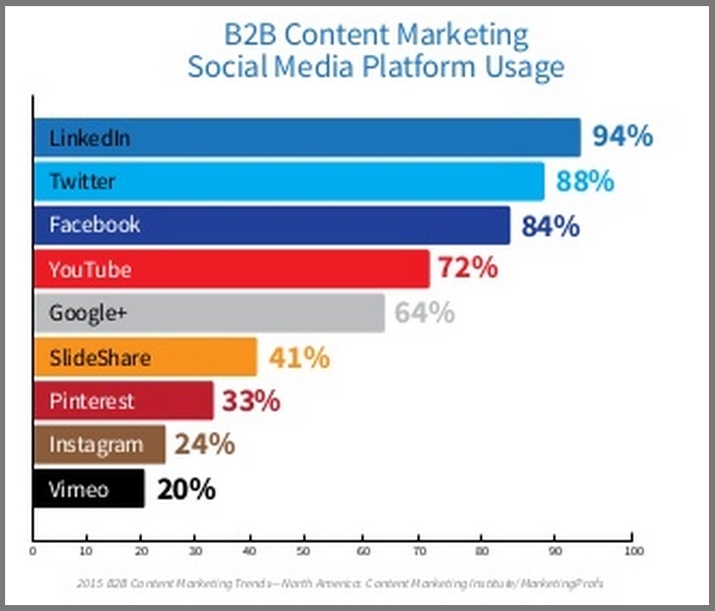 BTW, here’s more 2015 B2B Content Marketing information. Provide the information that your target audience actively seeks. Offer the 5 basic types of content. Don’t forget to include links back to your product pages. Integrate your branding into every piece of content. Since your content may be distributed across social media and email, make sure that people can recognize your brand. Talk human. Your content must sound like a real person. Remember you’re competing not only with your competitors but also their personal friends and interests. 3. Place your content where your target audience is. It’s not enough to have great quality content, you must distribute it where your target audience is. If they’ve got to work to find it, they may never see it. 94% of US B2B marketers use LinkedIn. 94% of US B2B marketers use Twitter. 84% of US B2B marketers use Facebook. 72% of US B2B marketers use YouTube. 64% of US B2B marketers use Google. Encourage everyone within your organization to participate in distributing your content. To this end, it helps to have social media guidelines in place and to let employees know when you publish new information. Make your content shareable. Include sharing icons as well as email, the king of social media, and printing out content, the 5th highest form of sharing!!! 4. Break down the walls between marketing and sales. I’ve worked in organizations where marketing did one thing and sales did another. Not only is this ineffective but it can also be costly since there’s duplicate effort. Instead lay the groundwork for co-content creation between marketing and sales. This is even more important in 2015 where B2B customers are most of the way through the sales process before they purchase from you. Establish meetings between marketing and sales. Get your teams together. Where appropriate, consider fun activities before putting everyone in one room to brainstorm. Taking the time to understand your customer and his needs to create amazing content is worthless to your organization unless you’re able to convert leads into sales. Include a call-to-action. Don’t leave prospect activity to chance. Ask them to take the next step. Incorporate tracking into every piece of content. Don’t leave metrics to chance. Plan to measure your success. To compete in the 2015 B2B marketplace takes planning. You have to move from a campaign mentality to an on-going engagement process. 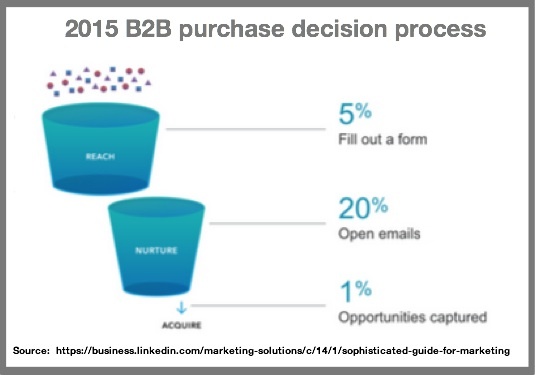 What other elements would you add to the 2015 B2B marketing process and why? 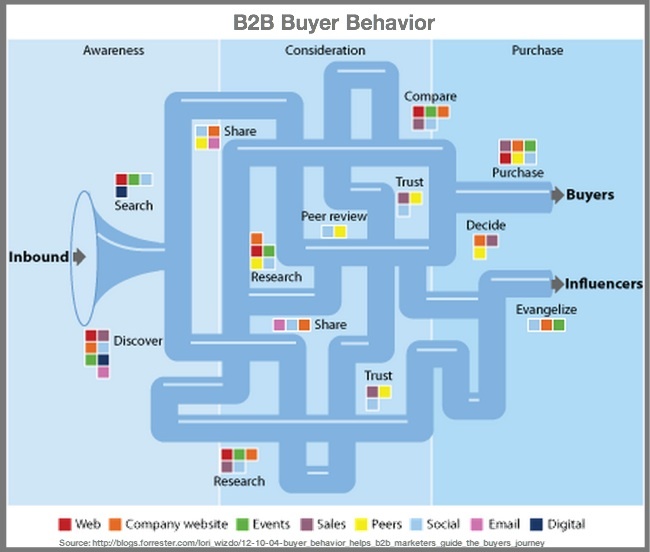 Tags B2B, Chart, Forrester, LinkedIn, McKinsey, Purchase Decision Process. Bookmark the permalink. Great article, Heidi! the only feedback I have is that your “share” left side banner is extremly annoying on iphones, it covers part of your content. But love your blog, and appreciate all the insights! Great article! I’ll definitely use some of these stats and charts in future presentations.